Sometimes recipe developing really frustrates me. Desperate to create something in my kitchen, only for the method, ingredients or baking time to require more work. Of course, posting recipes that actually work as opposed to something thrown together are favourable especially for the reader and those of you who make my recipes, but it can feel incredibly deflating when something requires more than a morning’s work. So it is genuinely thrilling when I start baking something I enjoy so much, the processes so enjoyable that I don’t mind making batch after batch to get them right. 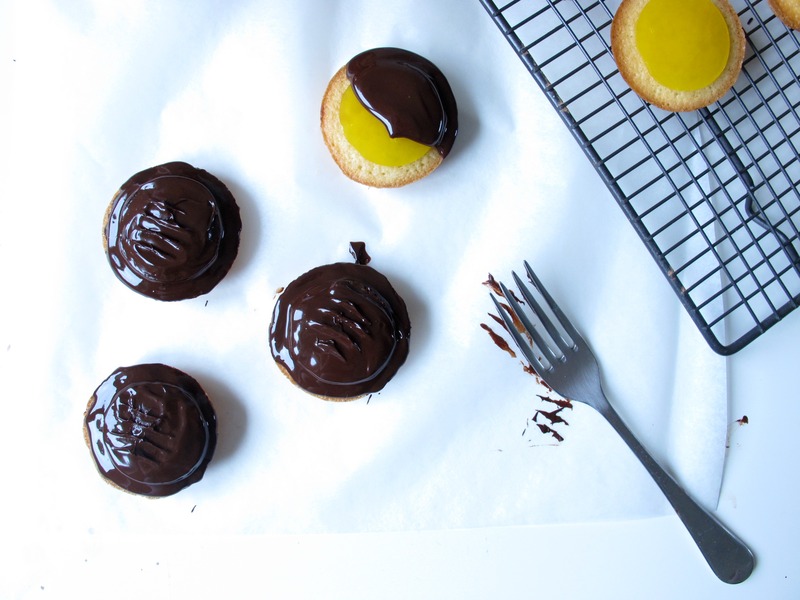 These homemade jaffa cakes were just that. I found The Boy Who Bakes’ recipe online one day and fancied having a go, but having only small supermarkets at my disposal, his blood orange jelly was out of my reach. Returning to the classic orange jelly, I instead played around with the flavour of the genoise sponge. I can highly recommend changing this recipe to include ground ginger, perhaps around ½ tsp into the sponge mix before baking but I wanted to take these mini cakes in a more fragrant and unusual direction with cardamom. It’s a relatively new spice to me, it lingers at the back of the cupboard rarely used, mostly because I can’t be bothered to drag the mortar and pestle out to grind the pods, but it is worth the effort. It complements orange so well, leaving a little kick on the palate long after you’ve devoured cake after cake which I may or may not have done during a House of Cards binge. 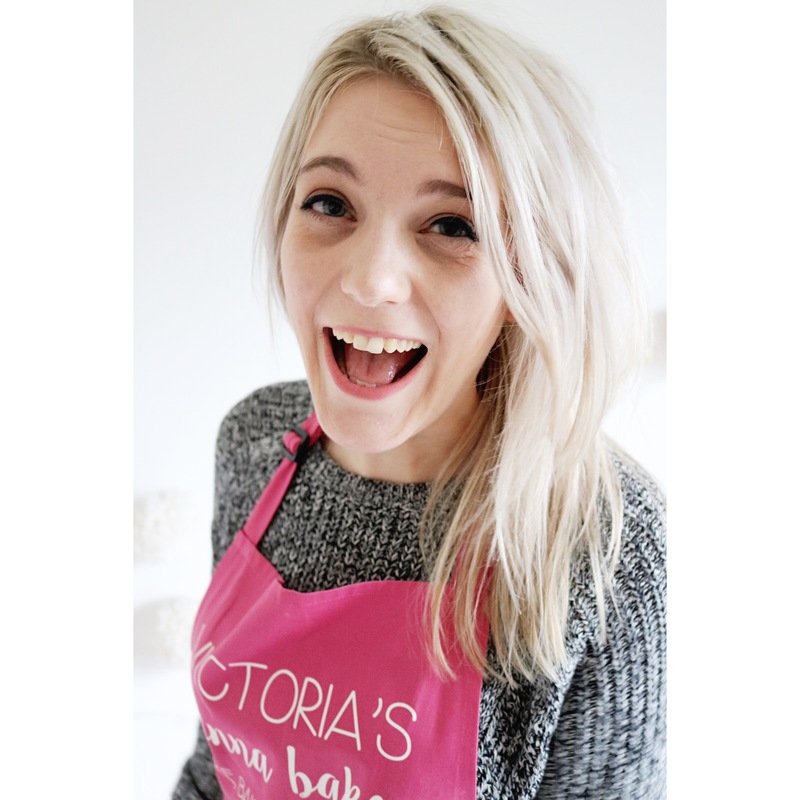 It can seem a rather daunting recipe with so many steps, but that’s only because I wanted to be very explanatory with each stage, especially when it comes to the chocolate. Of course you can simply melt the chocolate and pour on top of each cake, but without tempering you won’t get that beautiful characteristical snap when you take that first bite. It’s a process I’m still getting to grips with, first experimented with this cake, but one I find incredibly enjoyable and relaxing. 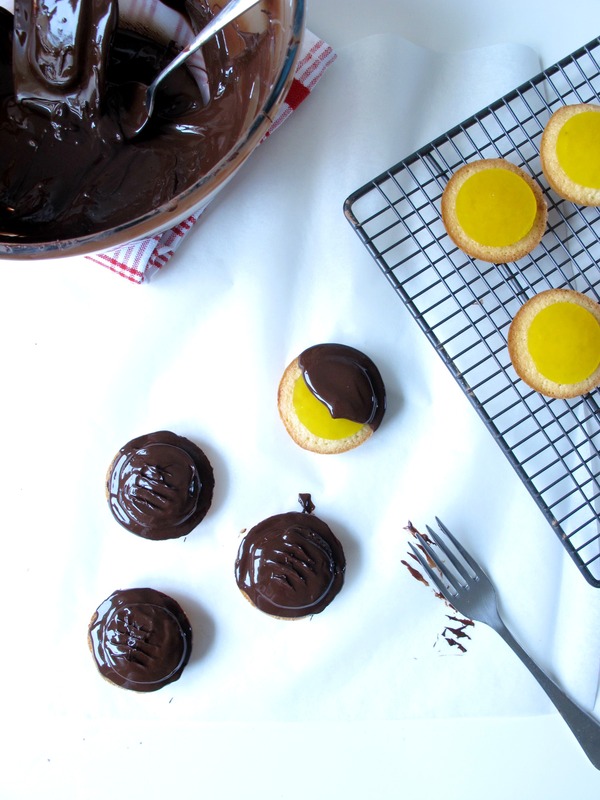 You can of course take this recipe slowly, making the jelly and setting overnight to save time, but the sponge is so incredibly quick to make, bake and cool the only real time you’ll spend is teasing the chocolate over the sponge and jelly discs, carefully pressing and pulling away a fork on top of each one to give it that classic jaffa cake look. And I promise, it is worth every minute. Lightly grease a 18-20cm round sandwich tin with a few sprays of sunflower oil and line with a sheet of clingfilm, smoothed out as much as possible. Place the orange juice and sugar in a saucepan and heat to a simmer. Meanwhile soak the gelatin leaves in cold water until soft and once the orange and sugar is bubbling, squeeze the water from the leaves and stir into the pan to melt. Pour the orange jelly in the cake tin and leave to cool at room temperature then place in the fridge. It should set within a couple of hours but I usually make this and chill overnight to save time. To make the cakes, preheat the oven to 180oc/160oc fan and butter each hole in a shallow fairy cake tin. In a stand mixer, beat the sugar and eggs together until pale and foamy, around five minutes. Crack open the cardamom pods and either crush in a mortar and pestle or blitz in a food processor with the flour. Once the eggs have whipped, sift over half the flour and cardamom mix and fold in carefully, scooping round the sides and folding through the middle until the dry mix is combined, taking care not to knock too much air out. Add the remaining flour and repeat, then add the melted butter and fold to combine. Spoon 1 tbsp into each hole in the pan and bake for 7 to 10 minutes until golden brown. You’ll have mix left over, so once the cakes have cooled slightly, scoop out the tin using a spoon and place on a wire rack then rebutter the tray and bake the remaining cakes. Leave to cool. 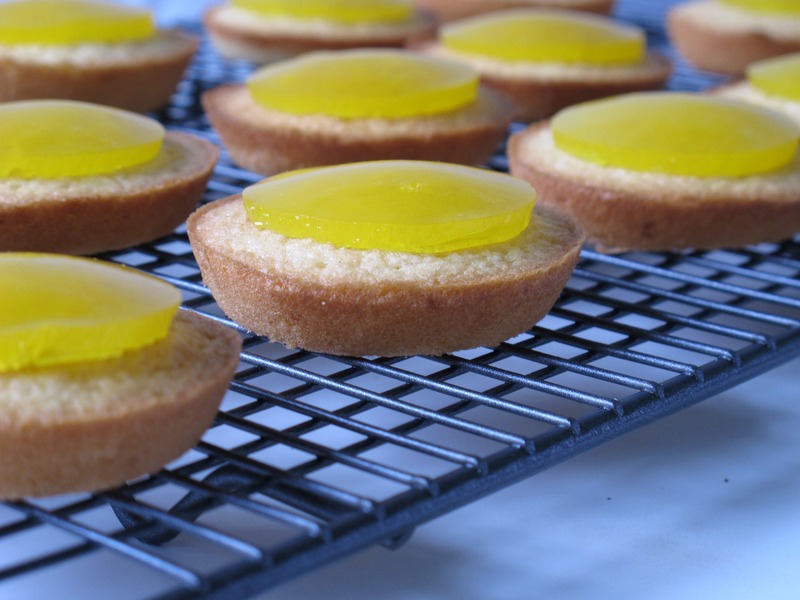 Using a small round cutter – I tried 2cm and 3cm and preferred the latter – cut enough circles from the jelly to top the cakes. I had to go for the slightly smaller cutter for the final three to get enough from the tray. Place on top of the cakes while you prepare the chocolate. Chop 100g of the chocolate into chunks and place in a large heat resistant bowl. Chop the remaining 50g finely and set aside. Place the larger bowl of chocolate over a pan simmering with water, taking care not to let the water touch the bowl and carefully melt to 54-58 degrees using a digital thermometer. Once the chocolate has melted to this temperature, immediately take the bowl off the saucepan and remove around a ⅓ of the chocolate, keeping it in a warm place. I usually leave it near the still-warm hob. Stir the finely chopped chocolate through the large bowl to bring the temperature down – keep stirring, it takes a while as you need to get it down to 28-29 degrees. Once the chocolate is smooth and suitably cooled, raise the temperature by adding the still-warm melted chocolate to the larger bowl and stir until it reaches 31-32 degrees. It is now tempered and ready to use. Tempered chocolate needs to be worked with fairly quickly, so dollop teaspoons of chocolate on top of the sponge and jelly and tease around the sides and top of each cake. Press a fork on top of the jelly for the characteristic lines if you wish but do this quickly – the chocolate needs to be fluid to achieve this look. Repeat with the remaining cakes until they are all covered in chocolate. Dont be disheartened if the chocolate starts to clump for the last few – the chocolate is still tempered and the cakes will still have a nice snap when eaten, just a less attractive appearance. You can melt the chocolate for a smoother finish but it won’t snap when eaten. Leave to cool then serve. These cakes last surprisingly well and taste lovely and fresh for the first few days and around five days later become slightly harder like packaged Jaffa Cakes. Either way, store in an airtight box at room temperature. 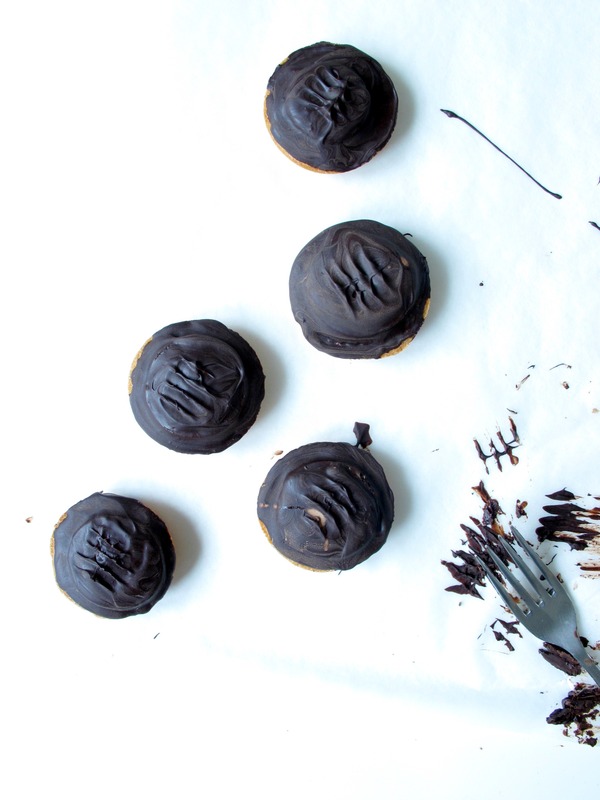 Thank you Abi, homemade jaffa cakes definitely beat shop bought ones!